Nothing looks more attractive than a clutter-free kitchen. If you yearn to be somewhere between a minimalist and a gourmet chef, it can be difficult to keep your cooking gadgets from creeping out all over your kitchen. We aren’t talking true minimalism here. If that were the case you would likely have a few pots and utensils, with little to no small appliances at all. It is certainly nice to have extra counter space to work at without clunky appliances taking up every available inch. The same is true of your floor space. It is an open, freeing feeling to be able to move around without avoiding obstacles. Being clutter free helps to prevent accidents. It also reduces the cost and maintenance of all those fancy appliances and extra serving dishes. Children are less likely to get into things they shouldn’t or get hurt in the kitchen. It is quite a bit easier to locate everything you need in a kitchen that is clean and organized. A drawback to having everything tucked away is that much-needed appliance or utensil may not be in your site or your reach when you want it. Here are a few ways to reduce your kitchen clutter. Put everything in its place and off the countertops. Resist the temptation to drop your mail and keys there for later use. If you need or want a few things left on the counter, try some coordinated pottery to hold utensils and keep them handy. Keeping soap and essentials on a trivet or platter also looks nice. Combine appliances that you need into multi-function versions. For example, a food processor, chopper, blender combination reduces 3 appliances to 1. A toaster oven replaces a toaster and an air fryer. An insta-pot replaces a pressure cooker and a crock pot. Open shelving is difficult to keep clutter free. Opt for closed cabinets instead. If it isn’t possible, look for attractive baskets and hooks to store your things away neatly. They can be used inside the cabinets also. Try to clean while you cook rather than saving it for later. Many of us are too tired after working and cooking to clean up properly after the fact. Get your partner or kids in on the act to make both the cooking and cleanup easier. Resist the urge to stack things on top of the refrigerator or attach lots of things to the face of it. Use the “One in, one out” method for artwork on the fridge. When you put something new on the fridge, take something down and store it or display is elsewhere. 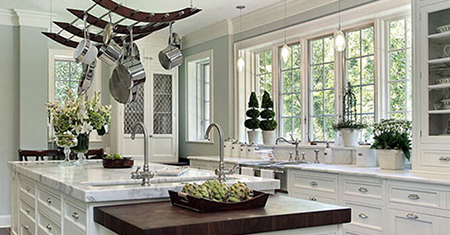 You will feel better about your kitchen and more eager to work in it when it is clean and organized. You will also have more pride in letting visitors see it.